NATURAL HABITAT AND PREFERRED SITE: Catalpa is native to the deep, moist, rich soils of east Texas but grows easily in a wide range of soils from sand to clay. Needs moderate moisture. 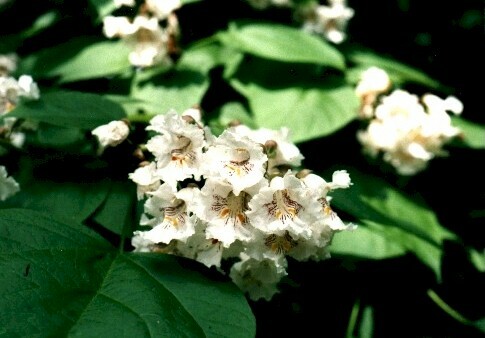 Catalpa is found in damp woods along the edges of swamps and streams and has been used quite extensively in landscaping. My recommendation for its best use is in parks and golf courses where it can be viewed from a distance. IDENTIFICATION INFORMATION: Catalpa is a very stately tree with extremely large leaves, showy flowers in the early summer and dramatic, long, cigar like seed pods in the fall and winter. FLOWERS AND FRUIT: Showy orchid like flowers in the late spring usually from May to June or sometimes starting earlier. Flowers are bell-shaped and about 2 inches in length. The color is white to lavender on the outside with two yellow stripes inside the throat and sometimes pale purplish blotches on the edges. Fruits are a cylindrical cigar-like capsules up to 18 inches in length with papery thin seed that are 1/6 inch long. BARK: Bark is smooth and dark gray to brown and sometimes reddish. The surface is broken into long irregular fissures with flat top ridges. FOLIAGE: Leaves of catalpa are large, dramatic, papery thin, and heart-shape that get ragged looking by the end of the growing season from wind and/or insect damage. They can be 6 to 12 inches long and 4 to 8 inches wide. Yellow fall color. CULTURE: Catalpa is easy to grow in most any soil. Needs moderate amounts of water and little fertilizer. Tree for full sun. Catalpa is a relatively fast growing tree but has a relatively short life. PROBLEMS: The plant is regularly attacked by the beautiful black and white catalpa sphinx (catalpa worm) which is used for brim and/or perch fishing especially in east Texas. The ragged leaves in the late summer are somewhat of a cosmetic problem. Catalpa’s biggest problem is that it is so maligned by educators. I was taught at Texas Tech that it is the most terrible, lousy, crummy, awful tree on earth and that all be cut down. I don’t agree with that. I very much enjoyed the catalpas that were in my parent’s yard in Pittsburg, Texas where I grew up. They are one the best climbing trees around because of the sparse limbs and smooth bark. Leaf blight can sometimes attack the tree causing leaves to sudden blacken and die. PROPAGATION: Collect the fruits after they have turned brown and begun to dry. Crush them inside a bag and plant the seeds in the spring outdoors after the last frost date. Good seed crops are only born every 2 to 3 years after the tree is 20 years old. There is some indication that germination is increased by leaving the seed capsules on the tree until February. Seed can be stored for some period of time at 50 degrees. Catalpa can be rooted from hardwood cuttings taken in late summer, root cuttings can be successful when taken in December. 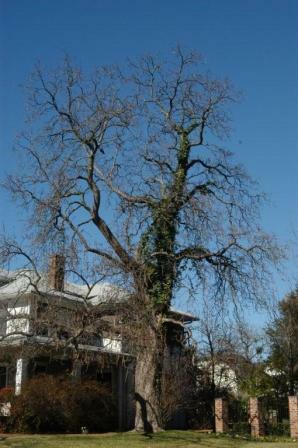 INSIGHT: Southern catalpa – Catalpa bignonioides is often confused with the northern species. They are very similar plants. Chitalpa is a smaller deciduous hybrid that is a cross between the desert willow and catalpa. It has long narrow leaves 6-8 inches long and 1-2 inches wide and pink or white catalpa- like flowers that bloom all summer. It is somewhat susceptible to root rot so extremely well-drained soil is important. The Sick Tree Treatment as a regular maintenance practice would be very beneficial for this tree.